Arthur Steven Lange Jr. (born October 11, 1967) is an American stand-up comedian and actor, best known for his tenures on The Howard Stern Show and the sketch comedy series Mad TV. Born and raised in New Jersey, Lange first worked as a longshoreman and taxi driver to help support his family following the death of his quadriplegic father. 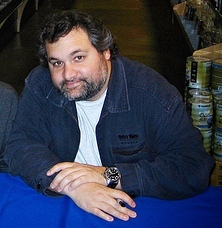 In 1987, he made his debut as a stand up comic and took up the profession full-time in the early 1990s, performing in clubs and improv shows in and around New York City. I was always a thin kid; I was an athlete. To tell you the truth, I always wanted to be a sketch comedian and a comedy actor. When political correctness first started coming around, it ruined Andrew Dice Clay and Eddie Murphy's stand-up career. Sam Kinison died at just the right time, 'cause no one was going to tolerate what he was saying anymore either. The Howard Stern Show is a big hit because it entertains dumb and smart people at the same time for different reasons. You know you're on stage being the life of the party and trying to get laughs, and then, in a lot of ways, you don't have anything to give once you give it to the people. I got cast on 'MADtv' as one of eight permanent cast members chosen from 8,000 comics who'd been screened. For any comic trying to make something of themselves, that was like hitting triple 7s-jackpot. Richard Lewis is the master at taking a joke that he's told a million times in a row in the past year, on the road, and making it look like he's pulling it out of thin air. The road is a lonely place, and that sounds like a cliche, you know, like what is my life? To tell you the truth, there are all these websites predicting my early death, and it's starting to work on me! I once dealt with a prima donna on a movie set. I won't say who, but his first name is a country. A communist country. Run by Fidel Castro. Woody Allen stayed so good because he never left New York. Howard Stern stayed so good because he never left New York - Mel Brooks when he just got out of New York was doing 'Blazing Saddles;' when he left New York he started doing stuff like 'Robin Hood Men In Tights' - he was in L.A. too long. He lost the edge. 'Course the world of sports takes itself way too serious. Sports writers are all high and mighty. Historically, a successful life in comedy is a dream that's as equally pondered and unpursued as being an astronaut. My dad was Superman to me, and in my mind he always will be.